Jerome (in Latin, Eusebius Hieronymus) was one of the most important scholars of the early Christian Church. His translation of the Bible into Latin would become the standard edition throughout the Middle Ages, and his viewpoints on monasticism would be influential over the centuries. Jerome was born at Stridon (probably near Ljubljana, Slovenia) sometime around 347 C.E. The son of a well-off Christian couple, he began his education at home, then continued it in Rome, where his parents sent him when he was about 12 years old. Seriously interested in learning, Jerome studied grammar, rhetoric, and philosophy with his teachers, read as much Latin literature as he could get his hands on, and spent a great deal of time in the catacombs under the city. Toward the end of his schooling, he was formally baptized, possibly by the pope himself (Liberius). For the next two decades, Jerome traveled widely. In Treveris (present-day Trier), he became extremely interested in monasticism. In Aquileia, he became associated with a group of ascetics who congregated around Bishop Valerianus; this group included Rufinus, a scholar who translated Origen (a 3rd-century Alexandrian theologian). Rufinus would become Jerome's close friend and, later, his adversary. Next, he went on a pilgrimage to the East, and when he reached Antioch in 374, he became a guest of the priest Evagrius. Here Jerome may have written De septies percussa (“Concerning Seven Beatings”), his earliest known work. In early spring of 375, Jerome became severely ill and had a dream that would have a profound impact on him. In this dream, he was hauled in front of a heavenly court and accused of being a follower of Cicero (a Roman philosopher from the first century B.C. ), and not a Christian; for this crime, he was horribly whipped. When he woke up, Jerome vowed that he would never again read pagan literature -- or even own it. Soon after, he wrote his first critical interpretive work: a commentary on the Book of Obadiah. Decades later, Jerome would minimize the importance of the dream and disown the commentary; but at the time, and for years afterward, he would not read the classics for pleasure. Not long after this experience, Jerome set off to become a hermit in the desert of Chalcis in the hopes of finding inner peace. The experience proved to be a great trial: He had no guide and no experience in monasticism; his weak stomach rebelled against desert food; he spoke only Latin and was terribly lonely among Greek- and Syriac-speakers, and he was frequently plagued by temptations of the flesh. Yet Jerome always maintained he was happy there. He dealt with his troubles by fasting and praying, learned Hebrew from a Jewish convert to Christianity, worked hard to practice his Greek, and kept in frequent correspondence with the friends he'd made in his travels. He also had the manuscripts he'd brought with him copied for his friends and acquired new ones. After a few years, however, the monks in the desert became involved in a controversy concerning the bishopric of Antioch. A Westerner among Easterners, Jerome found himself in a difficult position and left Chalcis. He returned to Antioch, where Evagrius once again served as his host and introduced him to important Church leaders, including Bishop Paulinus. Jerome had developed a reputation as a great scholar and serious ascetic, and Paulinus wanted to ordain him as a priest. Jerome only agreed on the conditions that he be allowed to continue his monastic interests and that he would never be forced to take on priestly duties. Jerome spent the next three years in intensive study of the scriptures. He was heavily influenced by Gregory of Nazianzus and Gregory of Nyssa, whose ideas about the Trinity would become standard in the Church. At one point, he traveled to Beroea where a community of Jewish Christians had a copy of a Hebrew text that they understood to be the original Gospel of Matthew. He continued to improve his understanding of Greek and came to admire Origen, translating 14 of his sermons into Latin. He also translated Eusebius' Chronicon (Chronicles) and extended it to the year 378. In 382 Jerome returned to Rome and became secretary to Pope Damasus. The pontiff urged him to write some short tracts explaining the scriptures, and he was encouraged to translate two of Origen's sermons on the Song of Solomon. Also while in the employ of the pope, Jerome used the best Greek manuscripts he could find to revise the Old Latin version of the Gospels, an attempt that wasn't entirely successful and, furthermore, wasn't very well received among the Roman clergy. While in Rome, Jerome led classes for noble Roman women -- widows and virgins -- who were interested in the monastic life. He also wrote tracts defending the idea of Mary as a perpetual virgin and opposing the idea that marriage was just as virtuous as virginity. Jerome found much of the Roman clergy to be lax or corrupt and did not hesitate to say so; that, along with his support of monasticism and his new version of the Gospels, provoked considerable antagonism among the Romans. After the death of Pope Damasus, Jerome left Rome and headed to the Holy Land. Accompanied by some of the virgins of Rome (who were led by Paula, one of his closest friends), Jerome journeyed throughout Palestine, visiting sites of religious importance and studying both their spiritual and archaeological aspects. After a year he settled in Bethlehem, where, under his direction, Paula completed a monastery for men and three cloisters for women. Here Jerome would live out the rest of his life, only leaving the monastery on short journeys. Jerome's monastic lifestyle did not keep him from getting involved in the theological controversies of the day, which resulted in many of his later writings. Arguing against the monk Jovinian, who maintained that marriage and virginity should be viewed as equally righteous, Jerome wrote Adversus Jovinianum. When the priest Vigilantius wrote a diatribe against Jerome, he responded with Contra Vigilantium, in which he defended, among other things, monasticism and clerical celibacy. His stand against the Pelagian heresy came to fruition in the three books of Dialogi contra Pelagianos. A powerful anti-Origen movement in the East influenced him, and he turned against both Origen and his old friend Rufinus. In the last 34 years of his life, Jerome wrote the bulk of his work. In addition to tracts on monastic life and defenses of (and attacks on) theological practices, he wrote some history, a few biographies, and many biblical exegeses. Most significantly of all, he recognized that the work he'd begun on the Gospels was inadequate and, using those editions considered most authoritative, he revised his earlier version. Jerome also translated books of the Old Testament into Latin. While the amount of work he did was considerable, Jerome didn't manage to make a complete translation of the Bible into Latin; however, his work formed the core of what would become, eventually, the accepted Latin translation known as The Vulgate. Jerome died in 419 or 420 C.E. In the later Middle Ages and Renaissance, Jerome would become a popular subject for artists, often depicted, incorrectly and anachronistically, in the robes of a cardinal. 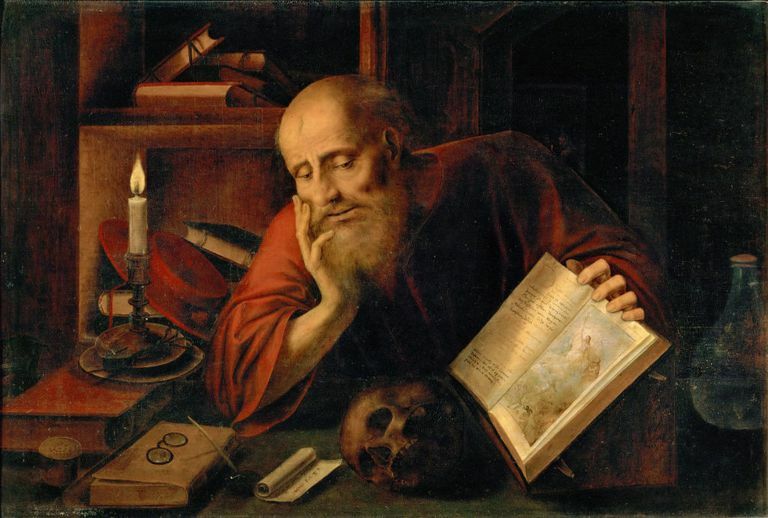 Saint Jerome is the patron saint of librarians and translators.